HINT: Installation is in the reverse order of removal. 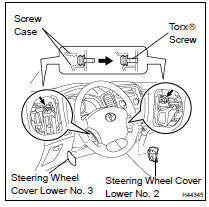 (a) Using a screwdriver, remove the steering wheel cover lower No.3. (a) Using a screwdriver, remove the steering wheel cover lower No.2. (a) Place the front wheels facing straight ahead. (b) Using a torx) socket wrench (T30), loosen the 2 torx) screws until the groove along the screw circumference catches on the screw case. (c) Pull out the horn button assy from the steering wheel assy and support the horn button assy with one hand as shown in the illustration. NOTICE: When removing the horn button assy, do not pull the airbag wire harness. (d) Disconnect the horn connector. (e) Disconnect the 2 connectors from the horn button assy. NOTICE: When handling the airbag connector, take care not to damage the airbag wire harness. (f) Remove the horn button assy. (a) Support the horn button assy with one hand as shown in the illustration. (b) Connect the 2 connectors to the horn button assy. (c) Connect the horn connector. (d) Confirm that the circumference groove of the torx) screw fits in the screw case, and place the horn button assy onto the steering wheel assy. (e) Using a torx) socket wrench (T30), tighten the 2 torx) screws. (a) With the horn button assy installed on the vehicle, perform a visual check including the following: Cuts, minute cracks or marked discoloration on the horn button assy top surface and in the grooved portion. (b) Make sure that the horn sounds. HINT: If the horn does not sound, inspect the horn system (see page 69-2 ).